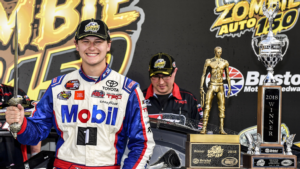 Winning in the NASCAR K&N Pro Series has almost become routine for Todd Gilliland. But Saturday marked a first for the two-time West champion, as Gilliland won for the first time at Bristol Motor Speedway with his victory in the Zombie Auto 150. It was Gilliland's 20th career K&N Pro Series victory in just 50 starts, but difficulties at Bristol in previous years made this win a little more special. "It means so much," said Gilliland, driver of the No. 98 Mobil 1 Toyota. "We've struggled here in the past and we just made the changes we needed to. Once you get that first (win) out of the way, you just kind of get that winning feeling. That really set the tone and for the last two seasons, I've just driven for really great teams. They've brought me really fast cars every week." Finding a rhythm in a race that had three red flags and numerous cautions was challenging, but Gilliland impressed down the stretch, taking a lead he never relinquished over the final 45 laps. He took the lead over Tyler Ankrum, who finished fourth, on the restart following the competition caution that took place on lap 101. Ankrum pitted during the break, but Gilliland took over against Harrison Burton and Noah Gragson, who qualified on the pole. The final restart came with 10 laps remaining, but the only real battle the rest of the way was for second. With Gilliland pulling away in the final laps, Burton and Gragson dueled for the runner-up spot, with Burton passing him on the inside with six laps remaining. It was a strong finish for Burton, driver of the No. 12 Dex Imaging Toyota, even if he couldn't track down Gilliland. "Crazy, I guess, is the word for it," Burton said of the race. "I was going back and forth between third and fourth, and I just wanted to get a shot at (Gilliland). After about 4-5 laps we came on really good and I thought we were probably the strongest car out there, but there just wasn't enough time." Gragson, driver of the No. 54 Switch Toyota, chalked up the restarts as a learning experience, as he could never quite best Gilliland on them. He was aiming for his first win at Bristol, but Gragson will now try to focus on getting that during the NASCAR Camping World Truck Series race in August. "It was just tough restarting there on the bottom," Gragson said. "You can't get your momentum rolling. I guess I'm just going to have to build on my notebook for when we come back here in the trucks. Man, I wanted to get that win so bad. We were just too tight there at the end." Gilliland performed well under pressure, especially on the final restart, but he credited the poise to a strong team that kept him locked in during the breaks in action. It paid off in the final laps, as Gilliland pulled away for a comfortable, memorable and rewarding victory.